After the January 16 mayoral candidates' forum on the arts at the Barrymore—co-presented by Arts + Literature Lab and Tone Madison—I wanted to take a few days to let the discussion sink in before weighing in with my own thoughts, and a few days turned into a week. Well, OK. (Props are due to Lindsay Christians of The Capital Times, Allison Geyer of Isthmus, and Tolu Igun of The Badger Herald for their reports on the event.) If you missed the event or want to revisit anything, please don't forget that we've got audio of the whole thing. One thing I'll say is that all five of the candidates who participated—Satya Rhodes-Conway, Mo Cheeks, Toriana Pettaway, Raj Shukla, and Nick Hart—all seemed to grasp that the arts intersect with city-level policy on a serious level, that what's good for artists in Madison is also going to be good for most people in Madison, and vice versa. And not just in a pat "arts are good for the economy" way—the candidates actually engaged in serious discussions about how things like zoning, policing, transit, and education come to bear on the health of the arts in Madison, and moderators Katie Hutchinson and Brian Standing steered them through a focused, substantive set of questions. The fact that about 400 people (and basically all the candidates but the incumbent) showed up to the event proves to me that Madisonians really do want to have a serious conversation about city government's role in arts and culture. These five candidates have told us that they care about the arts and that they get that they have a responsibility to nurture the arts. Well, hold them to it. Here are a few points we should keep looking at as the conversation continues. Incumbent Madison mayor Paul Soglin's campaign manager, Melissa Mulliken, let us know ahead of the forum that the mayor would not attend, citing a scheduling conflict. (He had a meeting with a local teachers' group that night.) The campaign sent along a written statement, which you can read here. It was a bit disappointing not to have the incumbent on hand to discuss his own record on the arts. That includes the Madison Music City program, which uses hotel-room taxes to fund events like Make Music Madison and the Between The Waves conference and festival. Had Soglin been there, I'm guessing he would have brought up some of his specific initiatives and gotten the conversation a little more into the weeds. Early in the forum, both Rhodes-Conway and Cheeks shouted out city arts administrator Karin Wolf by name and mentioned the city needs to hire more staff to support the work she's doing. I absolutely agree. Wolf doesn't have a support staff. She's the one full-time staffer at the city (with the arguable exception of Trent Miller, head of the Madison Public Library's Bubbler program) who focuses on arts-and-culture issues and deals with all the different city policies that bear on the arts. Wolf makes an incredible amount of stuff happen. All five candidates also seemed to agree that the city doesn't spend enough money on the arts, and they're right. Listening back to the forum, though, I'm realizing that nobody said anything remotely solid about what kinds of arts funding they'd push for during the city's annual budget process. Like, come on, anything—pledge to increase funding for arts grants by X percent, pledge to create at least one new city staff position for the arts, pledge to get the city's overall arts funding up to X amount of dollars. Because that annual budget process is what really counts here, and Madison's mayor, like a governor or a president, gets to have a lot of say in that process by proposing an executive budget. So, how would each of those folks use that to lead? I guess I have some follow-up reporting to do. I did appreciate Pettaway saying that the city needs to change how it approaches the process of awarding grants and implied that applying for city grants is an especially unpleasant process for people of color. "I can tell you, when the applicants go through these processes, they're not met with warm fuzzy experiences," Pettaway said. She also pointed out that the city could seek out more funding from government and private sources to fund its own grants program, and said that a true living wage in Madison would be around $21 or $22 per hour, not the oft-cited benchmark of $15. Nick Hart did specifically call for increasing funding for the Bubbler program and the city's BLINK grants (which give artists small amounts of money to support temporary public art installations), so that's something. I still don't know what to make of Hart's role here. As a stand-up comedian, he’s the only working artist running for mayor, and definitely the only one who’s performed on Conan. Sometimes he actually talks about policy, or at least shows an understanding of how it all fits together—during our forum, he talked about the multitudes of artists he knows who work multiple jobs and struggle to pay rent, for instance. And sometimes he uses his presence in the race for good: During a January 9 Capital Times debate at the Barrymore, Hart gave a bunch of his response-time cards to Pettaway, which I guess counts as leveraging one's privilege. Then again, he often responds to questions about policy with a "You want a comedian to answer that?" schtick. Oh, and not until after entering the race did Hart realize that he actually lives in the Town of Madison, not the City of Madison. Putting a merry provocative jackass in the mix can have its uses, but I just don't know. I may have signed his signature petition at a bar. I do think Hart is right to lay some of the responsibility on audiences: "It's out there, you just have to go support it," he said early in the debate. It sounds like an obvious point, but I think there are still too many people in Madison who are indifferent to the work of local artists and musicians, and that will have to change if any policy aimed at supporting the arts is to succeed. I've long been frustrated that Madison's bus service isn't really much use for getting to and from shows and other night time events. It's so centered around the daytime commute, and buses don't run very late. So I was pleased to hear Rhodes-Conway call for 24-hour bus service and say this: "I am a bus commuter, so I often find myself in the position of having taken the bus to work, and coming downtown, oh I'll stop to hear some music or go to a show or we'll go out to dinner or whatever, but I can't do that because I will not be able to take the bus home again." Rhodes-Conway also grappled with the fact that city zoning authorities don't always understand how artists use their spaces. Right now in Madison, a creative space with a variety of uses—gallery, performance, workshops, etc.—doesn't necessarily fit into a clear category, which can create all sorts of problems with licensing and compliance. Rhodes-Conway urged a more flexible approach and offered the night's most succinct summation of the challenges ahead: "The city tries to put things in boxes, and creatives don't live well in boxes." 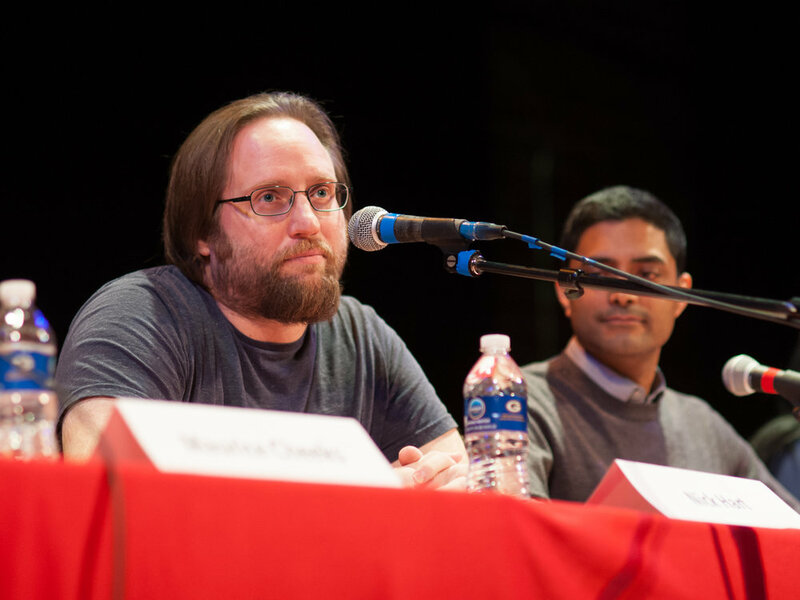 Both Shukla and Cheeks spent a lot of time framing Madison's private-sector prosperity as an opportunity for the arts. Cheeks specifically cited his experiences with local video game developers—who are indeed doing some promising work—and urged the city to invest more in creative entrepreneurs. "We see entrepreneurs of color disproportionately developing creative, artistic jobs and companies," Cheeks said. I don't always know what specifically Cheeks is proposing, but would be happy to see him or any other candidate give young entrepreneurs grants or space or other resources to help foster the arts and experiment. At one point, Shukla suggested going to the private sector for help funding arts programs in schools. I didn't hear the word "tax" in there anywhere, and hope he's not simply proposing city-guided philanthropic fundraising, because that's not a long-term solution. I do respect Shukla for mentioning Golpe Tierra, though—definitely the best local-arts/music name-drop of the night. I'm really convinced that the recent Task Force on Equity in Music and Entertainment report made both the candidates and audience at the forum more willing to consider the complex policy implications of the arts. The report basically looks at why hip-hop has often struggled to maintain a presence in local venues, but also delves into discriminatory policing, transportation, and other issues that don't immediately jump to mind when people think about the arts. Pettaway, who currently works as the city of Madison's equity coordinator, took an unsparing view of how the city has treated businesses that focus on serving people of color. Rhodes-Conway agreed with the report's finding that hip-hop events are over-policed. Every candidate should explicitly adopt that stance and accept that it sets them up for an uphill battle. (Not everyone in city government is going to want to act on the report’s findings, especially not a police department whose chief has been hostile to any kind of accountability or reform.) Cheeks also endorsed the report's recommendation that venue staff should receive cultural sensitivity training. There are definitely more fights to come over the report, and we should treat them as an opportunity to make sure that city officials take arts policy seriously.